In his dance of bliss (ananda tandava), Shiva displays both destructive and regenerative powers. He holds in his right hand a double-sided drum, representing creation; in his left hand is the fire of destruction and transformation, exemplifying his role as the destroyer at the end of each world age. 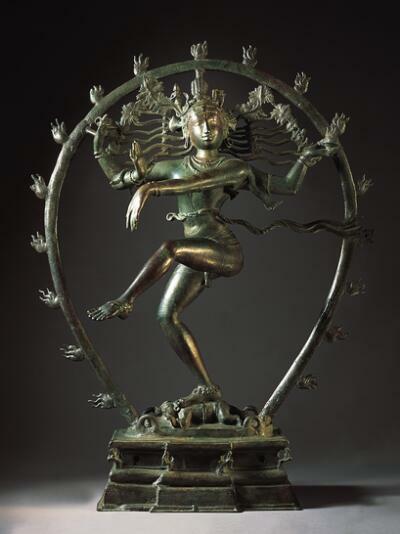 This balance of power takes place during Shiva’s dance, which the sculptor depicts in dramatic fashion. Shiva stands on his bent right leg, while his left leg and foot are raised across his body. So vigorous is Shiva’s dancing that his locks of matted hair become loosened from their once-tight formation, allowing the goddess Ganga to be caught in his hair before bringing forth the water of life to earth and avoiding a torrential deluge. Shiva as the Lord of Dance (Nataraja) is an iconic form rich with symbolic meaning. This supple figure honors the Hindu god Shiva as Nataraja, Lord of Dance. Poised gracefully in a moment of arrested motion, he's performing the dance of bliss. His locks of hair and his sash flutter outward, vividly emphasizing his whirling, fluid movements. Hindus revere Shiva as the embodiment of creative energy. Viewed as the destroyer, he represents the eternal cycles of death and regeneration. His dance has cosmic significance. He's haloed by a ring of fire, triumphing over illusion and ignorance. Notice the dwarfed figure crushed beneath his foot, a reminder of Shiva as the destroyer of ignorance. one would wish for human birth upon this earth." Originally, bronzes like this one were objects of worship, carried in processions from temples into the surrounding neighborhoods. On the base of this sculpture are two holes. Poles were passed through them so bearers could support the figures on their shoulders. Around this room, you can see other South Indian bronzes with loops that served the same purpose. The late-19th-century French sculptor Auguste Rodin was captivated by a Chola-period bronze of Shiva dancing. He proclaimed it the perfect embodiment of rhythmic movement, elegant and graceful, soft and powerful. You can see some of Rodin's famed bronzes outside the entrance to the Museum.